Trouble has erupted in Ardoyne today after the republican area was cleared by the PSNI police to allow an incendiary Orange march pass through. A parade involving relatively few Orangemen but over a thousand taunting, drunk loyalists bedecked in British colours openly provoked local residents in the ‘return parade’ this afternoon. Trouble began earlier today with a heavy-handed PSNI action to clear residents from the streets, in which at least one resident was injured in a PSNI clearance operation. Following the Orange march, the PSNI turned water cannon on nationalist youths who created a burning barricade and threw petrol bombs. A large group of loyalists were allowed to gather en masse just yards from the rioting, just outside the Ardoyne shops in north Belfast. The Orange Order is one of the few explicitly anti-Catholic organisations in the North, and its annual parades through Catholic areas have been likened to the actions of the Ku Klux Klan in the US. Orangemen argue that their July ‘Twelfth’ marches are celebrations of Protestant culture, marking the anniversary of the Battle of the Boyne victory of Protestant King William over the Catholic King James in 1690. 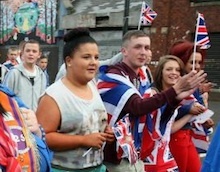 Last year scores of local youths were jailed for rioting against the Orange Order’s parade on the basis of video evidence provided by the mainstream media.